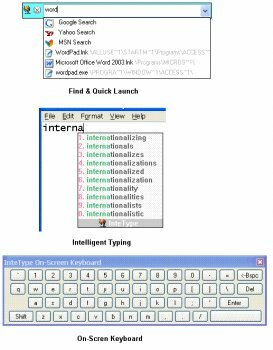 CuteType is a keyboard launchpad and provides a way of accessing all types of files, launching programs and searching information on the Web with Google, Yahoo and MSN. You can also use CuteType to get to your bookmarks with support for both IE and Mozilla/Firefox browsers. Just type a few letters of what you are looking for and CuteType searches and launches it. It offers autocompletion and predictive text entry, and enables users to recall spelling and to increase typing accuracy and speed.